TOKYO: A new slogan adopted by Prime Minister Shinzo Abe and meant to show that all Japanese will benefit from economic growth is raising eyebrows among those who see it as an eerie echo of wartime propaganda. 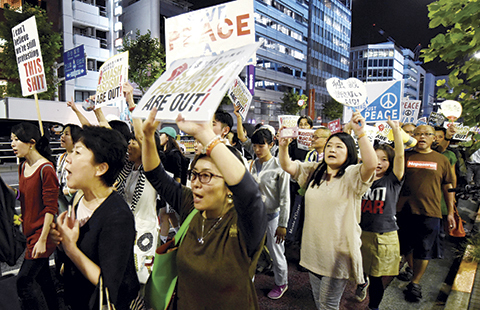 Asked about the perception that the phrase echoed wartime rhetoric, a government source familiar with Abe’s thinking said, “The biggest meaning is ‘inclusive growth’.” Abe, 61, has often spoken of “escaping the post-war regime”, a legacy of the US occupation that conservatives say eroded national pride and traditional mores. Political analysts say the new slogan and Abe’s three new “arrows” of economic policy, ranging from a strong economy, and support for childrearing, to a stable social security system, are aimed at wooing voters ahead of an upper house poll next July.